Anyway, with Christmas approaching quickly, we are all trying our best to fit in as many holiday outfits as we can into our lives. If you're still on the search for the perfect holiday leggings, I gotchu. 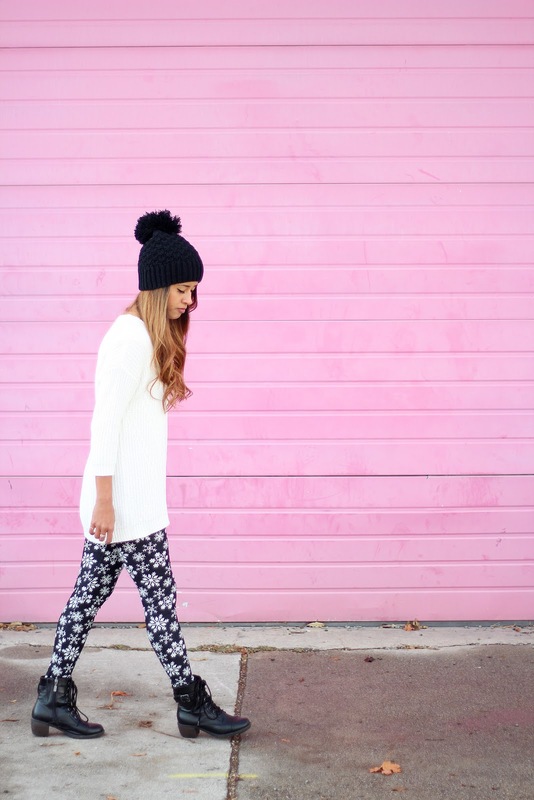 White Plum has the BEST collection of holiday print leggings you can find! And they're all $20 each. Yasssss. They have reindeer, snowflake, plaid, nordic, you name it, they have it. You can wear them for your family Christmas photos, to a Christmas work party, and of course, on actual Christmas day! Make sure you stock up because you'll wanna be sporting these babies all season long! As a bonus, use the code ARIELGIVES25 for 25% off your entire White Plum purchase! That code expires on December 11 so make sure you use it quickly! Great pics! Love the background and a comfy pair of leggings! such cute leggings! plus I love that little hat. I would totally wear that outfit-especially here in LA. Love the leggings and love how you paired them with combat boots! Perfect style!